From our random trivia department: Jack Johnson, the first black heavyweight champion of the world, wasn't merely a master of the sweet science. He also knew a thing or two about the physical sciences. In 1913, Johnson was convicted of violating the Mann Act, a law often used to stop black men from traveling with white women. Johnson skipped bail and fled the country with his white wife, Lucille. The two lived on the lam in Europe, South America and Mexico for the next seven years. In 1920, Johnson surrendered to federal agents at the Mexican border and was sent to Leavenworth Federal Prison. While serving his time, he made some improvements to the standard wrench. 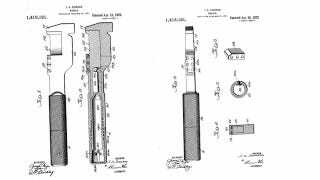 Johnson patented his modified wrench, but the tool never caught on. That's it up top. You can read the full patent here (if you insist).